The wireless microphone consist of a body pack battery powered transmitter, and mains powered diversity receiver. As an included accessory, the body pack wireless systems come with either a ME2 ( omni directional ) or ME4 ( directional ) lavalier mic. 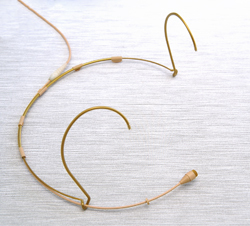 The DPA headset microphone is an added option which is used with the body pack transmitter. Pictures of these can be seen below. Before a wireless system is used at your location, the frequencies have to be set up to avoid " Intermodulation Distortion" . 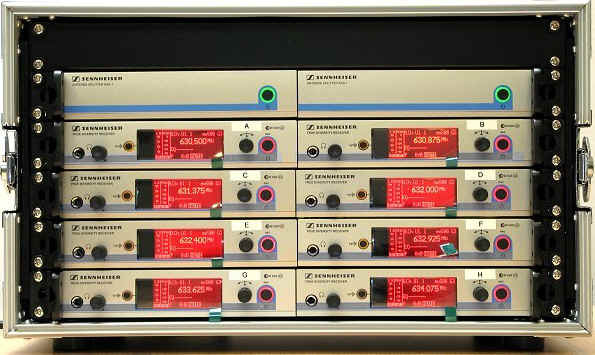 Intermodulation Distortion will affect the reception of one or all of the receivers if not set up correctly. Although perhaps your chosen frequencies may seem well spaced, but harmonics can be generated and transmitted along with the original signal. These harmonics can cause interfere with other channels. Frequencies are pre set to so as not to interfere with the neighboring frequencies, this is done by using the recommended set frequencies. We can also prepare our wireless systems to be used in conjunction with your existing wireless system frequencies, subject to the frequency range band, and compatibility. We also supply a free JMFG frequency license for the duration of the hire. See Note 1. below. A full user guide is included with every wireless system hire. Notes for the correct use for the DPA headsets ( also supplied ) should be issued to all performers, dressers and assistants to minimize damage. Please note that our DPA headsets have 3.5mm locking jack plugs which are compatible with all of the Sennheiser Evolution range. Walker Sound also have available a comprehensive range of sound and lighting equipment for hire, including Meyer UPA-1C loudspeakers, which have also become an industry standard for theater presentations. Please see the main Hire Price List for equipment list and prices. Please see the Contact Details page, for further information and quotations. Under UK law (Wireless Telegraphy Act 2006), a license is required for "Programme Making and Special Events" (PMSE). This includes uses of wireless microphones, talkback ( walkie-talkies ) and production services in theatrical performances, radio and television programmes, conferences, places of worship and so on, but only when directly associated with the performance or event. Radios used for general security, catering, crowd control and so on, need a license issued by Ofcom. All hire equipment is subject to a Hire Agreement Form whereby the hirer is responsible for the equipment by way of damage, loss or theft incurred whilst in their care. tie clip lavalier microphone, body pack, and hand held ( battery powered transmitters ). Full price list also on the main Hire Price List pages. Schools & College discount - see above. For Technical Specification see HERE.